If you have ever watched a Real Estate TV show, you would have heard that nothing beats location when it comes to where to live. Why should it be different when you are looking into downsizing? Stephen and Bronwen Williams chose to move back to South Australia from Victoria when they decided it was time to retire and claim that Bay Waters location had everything to do with their decision. Stephen is a photographer and his wife Bronwen is an artist, so every event they attend at the Bay, offers them an opportunity to tap into their talents. For Stephen, photography has always been a hobby and when his wife stopped working full time and had time to dedicate to painting, it seemed like the perfect opportunity to take photos that his wife would transform into paintings. “We do it as a hobby and not to sell or exhibit,” he added. After a lifetime taking photos of his children, family, friends and the places they visited, Stephen took over 3 years to scan all his photos into a computer. Over 10 thousand photos were taken just last year! Considering the location of their home and the views from their balcony, it’s likely the number of photos will only increase. If you are ready to live in a picture-perfect location, please visit karidisretirementvillages.com.au and book an inspection to one of our displays at Bay Waters. 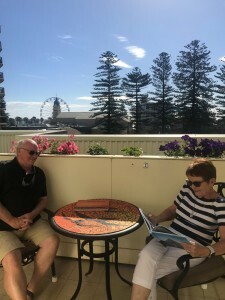 Stephen and Bronwen Williams enjoying the views at Karidis Bay Waters.